These deposits can be observed using satellite images as they have undergone a process known as "topographic inversion." In this process, the deposits filling one topographically low river channels have been exhumed is such a way that today they exist in the form of ridges at the surface of Mars, researchers said. Various studies have recently claimed about the presence of water on Mars, a breakthrough that led to many thinking about the possibility of establishing human colonies on the red planet. 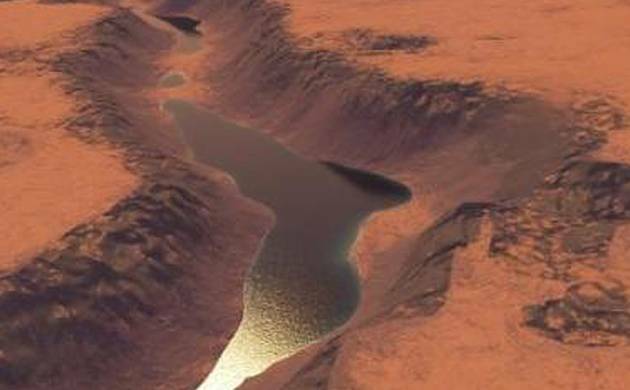 Now, researchers have come up with more evidence of water on early Mars. A study has claimed that the environment of the red planet more than 3.5 billion years ago supported liquid water on the surface. The surface of Mars has river deposits spread across the planet, according to the study published in the Geological Society of America (GSA) Bulletin. A region on the red planet named Aeolis Dorsa contains some of the most spectacular and densely packed river deposits on Mars, said the study. Benjamin T Cardenas and colleagues from Jackson School of Geosciences at the University of Texas at Austin used high-resolution pictures and topographic data from cameras installed on orbiting satellites and identified fluvial deposit stacking patterns and changes in sedimentation styles controlled by a migratory coastline. In order to measure river paleo-transport direction for a subset of these ridges, the researchers came up with a method. These measurements when put together demonstrated that the studied river deposits once filled incised valleys. During the falling and rising eustatic sea level on Earth, the incised valleys are commonly cut and filled. According to the researchers, similar falling and rising water levels in a large water body resulted in the formation of the paleo-valleys in their study area. "We present evidence that some of these fluvial deposits represent incised valleys carved and filled during falls and rises in base level, which were likely controlled by changes in water-surface elevation of a large lake or sea," the study said. At the valley-scale, cross-cutting relationships were observed, indicating multiple episodes of water level fall and rise, each well over 50 metres, a similar scale to eustatic sea level changes on Earth.